Origin: Purchased at an office supply store; Matsapha, Swaziland, 1993. 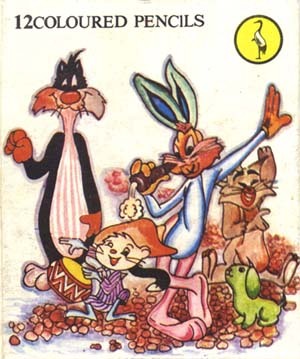 Hey, didja ever see that one cartoon where Bugs Bunny ate a brown carrot and he turned green, orange, blue and pink? Then Sylvester teamed up with Tom and together they took care of Tweety and Jerry once and for all. Remember that? Well, me neither. Oh, and remember these guys? I don't.